Positive displacement gas boost systems trap a fixed quantity of gas behind each impeller and then force that trapped quantity into a discharge pipe to raise the pressure level of existing gas sources to levels suitable for industrial-strength burners, boilers, heaters, and other applications. Action Blower & Equipment (ABE) has long been an industry leader in the production of positive displacement and other types of gas boosters for the commercial HVAC industry. We at ATI, therefore, unhesitatingly recommend their gas boost systems to our clients and offer assistance in the selection and purchase of ABE products. 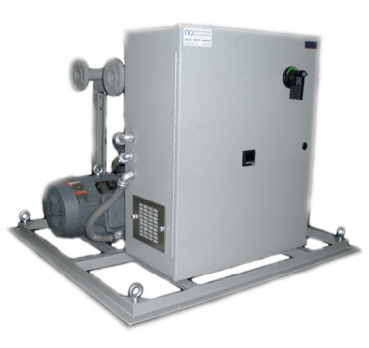 Action Blower & Equipment's line of positive displacement gas boosters, model PDGB, are complete, "turnkey" units that are exceptionally easy to install and maintain. They make use of ABE's energy-saving Greenbooster technology, which ensures pressure is only raised so much as is needed at any given moment. PDGB works well across a broad range of medium to high pressure industrial/commercial applications. While standard PDGB features are industry leading and well suited for a wide range of applications, ABE can also add on additional accessories and/or remove or change features as needed in order to give you a fully customized unit upon request. ABE is committed to engineering each PDGB or other gas boost system it sells to ensure the highest possible performance, efficiency, safety level, and product lifespan.